Sparks Computerized Car Care in Muncie, IN performs expert brake repair services. The beginning to any brake service usually begins with you. Either you notice, or someone around you notices that something is not right about your brakes. The early warning signs will be a high-pitched squeal at first. For you to notice, you might need to turn your car stereo down, but everyone outside your car can hear you loud and clear. Your brake pads were designed to give you this noisy alert when your brake pads have worn down. This is definitely the perfect time to bring your vehicle to Sparks Computerized Car Care for brake service. Depending on how quickly you bring us your brakes to get checked out, your braking system will be susceptible to damage. 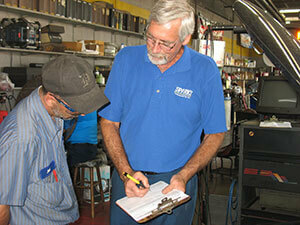 Our ASE Certified Techs are here to perform any brake repairs that may arise. Any damage to your brakes’ calipers, rotors, discs, or any part of your braking system can be fixed by us. Your vehicle’s braking system is in dire need brake repair service if the pads have worn through to the metal. You will hear and feel an unmistakable grinding noise when pads are worn off. Anytime a vehicle is operating with metal on metal components, this is definitely an emergency. Your vehicle’s braking system is no different. If your brakes are in poor condition, you should cease driving with them, and the next stop should be at Sparks Computerized Car Care. Any problems with your braking system will be handled by our brake repair specialists. We’ll get you fixed up and back on the road in no time. Give us a call today to schedule an accurate brake diagnosis or repair.